Running out of cool car detailing product to buy, any suggestions? What cool thing have you found that rocks your world? Last edited by Porsche2018; 03-16-2018 at 06:29 AM. R Doug and rvacs like this. Thanks Rick will explore those products and yes, as you stated, no Petroleum products on the PPF. I purchased and am waiting on Pinnacle Signature Series II Carnauba Paste Wax and will post as soon as I get a chance to use it. I also use Griot's products as well and have been very happy for years. Porsche2018 and rvacs like this. 2018 718 in Black Black Interior, Premium Package, Porsche Exclusive Carrera Sport 20" Wheels, Speed Yellow Dials, Seatbelts and Ext Color match Interior. There Best Of Show Wax is hard to remove but looks fantastic. Put on 3 coats before removing. Do you mean you apply and let three layers of wax dry before removing it or you do three wax applications each time? The "Best of Show" do you use the liquid or paste? Last edited by Porsche2018; 03-16-2018 at 06:18 AM. Porsche2018 and dhc3 like this. I too also use only products from Griot. It's waterless and works really well. Three coats must shine like crazy; do you use the paste or liquid wax? Liquid. 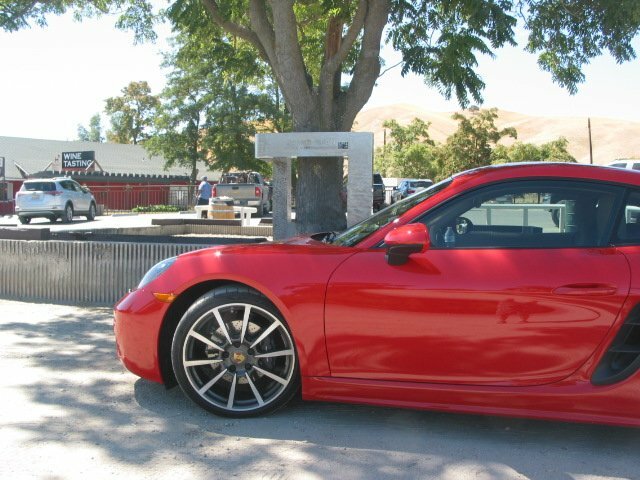 Here is the Cayman @ James Dean Memorial on the way to Laguna Seca last year. Great looking, is that Guards?